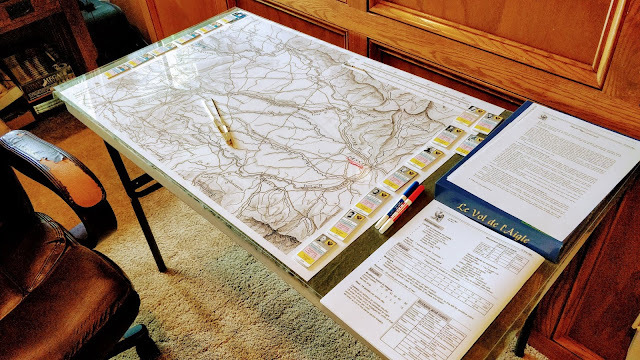 Some of you may recall that for eighteen months ending this past June, I participated in an operational level Kriegsspiel run through the forums at Grogheads concerning Napoleon's 1806 campaign in Prussia. I portrayed Jean Lannes commanding the French III Corps. Despite the length of the game, a good time was had by all. Such a good time, in fact, that we've kicked off another game, this time covering the opening days of the 1809 campaign, otherwise known as the War of the Fifth Coalition. This is the campaign so brilliantly described in John Gill's trilogy, Thunder on the Danube. I was originally slated to play Lannes again, but the number of people wanting to play was so large that we elected to open a second game, which I'm umpiring. I suspect I'll have enough to do being an umpire that I gave up my player spot to someone else. Above you can see the map I'll be using to track the campaign progress. We're using the Le Vol de l'Aigle rules from Pratzen Editions for the games, as we did for the 1806 campaign. I won't be able to post much more about the campaign until things are wrapped up (so I don't reveal any information to players inadvertently) but if you'd like to see how one of these things go, my Grogbrother Jim did a great series of videos about the 1806 campaign you can watch from Grogheads.